Check the coolant level in the reservoir when the engine is cold. If the coolant level is below the MIN level B , add coolant to the MAX level A . If the reservoir is empty, check the coolant level in the radiator when the engine is cold. If there is insufficient coolant in the radiator, fill the radiator with coolant up to the filler opening and also add it to the reservoir up to the MAX level A . This vehicle contains Genuine NISSAN Long Life Antifreeze/Coolant (blue). The life expectancy of the factory-fill coolant is 105,000 miles (168,000 km) or 7 years. Mixing any other type of coolant or the use of non-distilled water will reduce the life expectancy of the factory-fill coolant. For additional information, refer to the “NISSAN Service and Maintenance Guide”. If the cooling system frequently requires coolant, have it checked by a NISSAN dealer. 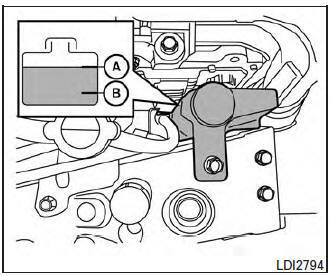 For additional information on the location of the engine coolant reservoir, refer to “Engine compartment check locations” in this section.